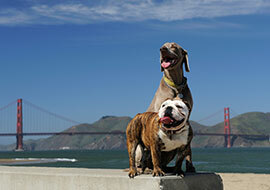 Forget the dog-sitter and bring your furry best friend along with you on your journey to San Francisco. Located in downtown San Francisco just steps away from Union Square, we are the perfect location for you and your pet to explore the City. The King George Hotel - A Greystone Hotel is a pet friendly hotel that not only welcomes you and your pet, but makes sure you both are treated to an exceptional experience! 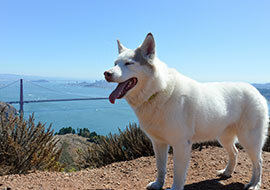 We do have a one-time pet fee of $50 per stay (one pet max and 40 lb. limit). We hope your four-legged best friend enjoys their stay with us as much as you do! Our pet package will fit your room with a doggie bed, feeding mats ,food and water bowls- plus you get access to our Fido's Market Place, where you may find pet essentials like pick--up bags, treats and leashes! 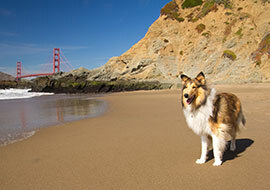 The King George is a pet friendly San Francisco hotel located in the heart of Union Square near the best parks, restaurants, and shops for you and your four-legged friend!